Is Marijuana A Safe Drug To Take? I found out there is a lot of false data on marijuana, such as "since it is coming from nature, it can't hurt you" or "it helps my concentration" or "it allows me to be more creative," etc. Well, this is my answer to those who tell me that it is safe because it’s “natural” - “Okay, how about those poisonous mushrooms that can kill or make you very sick when you eat them?” Those are coming from nature and they do not help the body at all. Marijuana is the word used to describe the dried flowers, seeds and leaves of the Indian hemp plant. On the street it is called by many other names, such as: astro turf, bhang, dagga, dope, ganja, grass, home grown, j, mary jane, pot, reefer, roach, texas tea and weed. Regardless of the name, this drug is a hallucinogen - a substance which distorts how the mind perceives the world you live in. Marijuana smokers have poorer memories and mental aptitude than do non-users. Animals given marijuana by researchers have even suffered structural damage to the brain. Of adults 26 or older who used marijuana before age 15, 62% went on to use cocaine at some point in their lives; 9% went on to use heroin at least once; and 54% made some non-medical use of mind-altering prescription drugs. Over the last 10 years, many children of marijuana users have been born with reduced inititiative and lessened abilities to concentrate and pursue life goals. Studies also suggest that prenatal (before birth) use of the drug may result in birth defects, mental abnormalities and increased risk of leukemia in children. 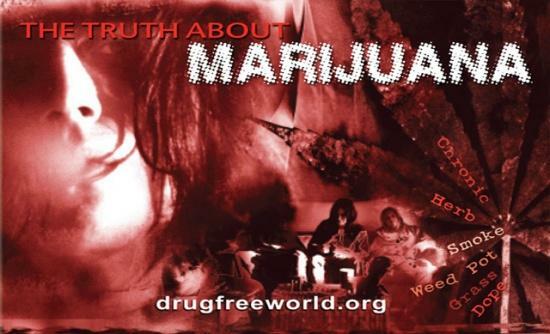 For more information contact: WWW.DRUGFREEWORLD.ORG or me personally at 615-563-4292 or by e-mail at thetasaver@dtccom.net. So true! Its a shame so many people truly believe marijuana is safe. I have seen the harmful effects of it over and over in peoples lives. I hope its never legalized. So people like Andy Warhol, the Beatles, Bob Dylan, Bob Denver (who played Gilligan on Gilligan's Island), Carl Sagan, Conan O'Brian, George W Bush, George Washington, Pablo Picasso, Thomas Jefferson, William Shakespeare, Willie Nelson, Neil Diamond,who all have smoked marijuana; as well as the millions of other people who use marijuana for medicinal uses have poorer memories and mental aptitude than do non-users? FYI: What isn’t well known is that FDFW is run by the Church of Scientology which might explain the blatant attempts to deceive. As such it is considered one of the cult's front groups. Scientology promotes the medical quackery thought up by Scientology founder L. Ron Hubbard.